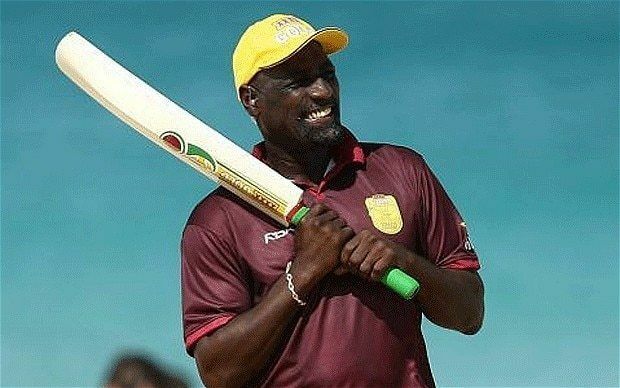 Sir Isaac Vivian Alexander Richards, KNH, OBE (born 7 March 1952), known as Viv Richards, is a former Antiguan cricketer, who represented the West Indies at test and international levels. He is regarded as one of the greatest batsmen of all time. Richards was voted one of the five Cricketers of the Century by a 100-member panel of experts in 2000, along with Sir Donald Bradman, Sir Garfield Sobers, Sir Jack Hobbs and Shane Warne. In one-day cricket, Richards was judged by Wisden Cricketers' Almanack to have played the best One Day International (ODI) innings of all time. In December 2002, he was chosen by Wisden as the greatest ODI batsman of all time, as well as the third greatest Test batsman of all time, after Sir Don Bradman and Sachin Tendulkar. His consistent batting ability is highly regarded; he is the first cricketer in ODI history to achieve 20 Man of the Match awards. Overall, Richards scored 8,540 runs in 121 Test matches at an average of 50.23, including 24 centuries. As a captain, he won 27 of 50 Test matches and lost only 8. He also scored nearly 7,000 runs in One Day Internationals and more than 36,000 in first-class cricket. Knighted for his contributions to cricket, today Richards is an occasional cricket commentator and team mentor. Richards was born to Malcolm and Gretel Richards in St. John's, Antigua, then part of the British Leeward Islands. He attended St. John's Boys School and then Antigua Grammar School on a scholarship. Richards discovered cricket at a young age. His brothers, Mervyn and Donald, both played the game, representing Antigua as amateurs, and they encouraged him to play. The young Viv initially practiced with his father and Pat Evanson, a neighbour and family friend, who had captained the Antigua side. Richards left school aged 18, and worked at D'Arcy's Bar and Restaurant in St. John's. He joined St. John's Cricket Club and the owner of the restaurant where he worked, D'Arcy Williams, provided him with new whites, gloves, pads and a bat. After a few seasons with St. John's C.C., he joined Rising Sun Cricket Club, where he remained until his departure to play abroad. Richards made his first-class debut in January 1972 when he was 19. He took part in a non-competition match, representing the Leeward Islands against the Windwards: Richards made 20 and 26. His competitive debut followed a few days later. Playing in the domestic West Indian Shell Shield for the Combined Leeward and Windward Islands in Kingston, Jamaica versus Jamaica, he scored 15 and 32, top-scoring in the second innings in a heavy defeat for his side. By the time Richards was 22, he had played matches in the Antigua, Leeward Islands and Combined Islands tournaments. In 1973, his abilities were noticed by Len Creed, Vice Chairman at Somerset, who was in Antigua at the time as part of a West Country touring side. Richards relocated to the United Kingdom, where Creed arranged for him to play league cricket for Lansdown C.C. in Bath. He made his Lansdown debut, as part of the second XI, at Weston-super-Mare on 26 April 1973. Richards was also employed by the club as assistant groundsman to head groundsman, John Heyward, to allow him some financial independence until his career was established. After his debut he was promoted to the first team where he was introduced to the Lansdown all-rounder "Shandy" Perera from Ceylon (now Sri Lanka). Richards cites Perera as a major influence on his cricket development especially with regards to post-game analysis. He finished his first season at Lansdown top of the batting averages and shortly afterwards was offered a two-year contract with county side Somerset. Richards then moved to Taunton in 1974 in preparation for his professional debut with Somerset CCC where he was assigned living accommodation by the club; a flat-share with two other county players: Ian Botham and Dennis Breakwell. On 27 April 1974 Richards made his Benson & Hedges Cup debut for Somerset against Glamorgan in Swansea; after the game Somerset skipper Brian Close arranged a player's ovation for Richards in recognition of his playing and contribution to the victory. Richards was awarded Man of the Match. Richards made his Test match debut for the West Indian cricket team in 1974 against India in Bangalore. He made an unbeaten 192 in the second Test of the same series in New Delhi. The West Indies saw him as a strong opener and he kept his profile up in the early years of his promising career. In 1975 Richards helped the West Indies to win the inaugural Cricket World Cup final, a feat he later described as the most memorable of his career. He starred in the field, running out Alan Turner, Ian Chappell and Greg Chappell. The West Indies were again able to win the following World Cup in 1979, thanks to a Richards century in the final at Lord's, and Richards believes that on both occasions, despite internal island divisions, the Caribbean came together. He was until 2005 the only man to score a century and take 5 wickets in the same one-day international, against New Zealand at Dunedin in 1986–87. He rescued his side from a perilous position at Old Trafford in 1984 and, in partnership with Michael Holding, smashed 189 to win the game off his own bat. 1976 was perhaps Richards' finest year: he scored 1710 runs, at an astonishing average of 90.00, with seven centuries in 11 Tests. This achievement is all the more remarkable considering he missed the second Test at Lord's after contracting glandular fever; yet he returned to score his career-best 291 at the Oval later in the summer. This tally stood as the world record for most Test runs by a batsman in a single calendar year for 30 years until broken by Mohammad Yousuf of Pakistan on 30 November 2006. Richards had a long and successful career in the County Championship in England, playing for many years for Somerset. In 1983, the team won the NatWest Trophy, with Richards and close friend Ian Botham having a playful slugging match in the final few overs. Richards captained the West Indies in 50 Test matches from 1984 to 1991. He is the only West Indies captain never to lose a Test series, and it is said that his fierce will to win contributed to this achievement. His captaincy was, however, not without controversy: one incident was his aggressive, "finger-flapping" appeal leading to the incorrect dismissal of England batsman Rob Bailey in the Barbados Test in 1990, which was described by Wisden as "at best undignified and unsightly. At worst, it was calculated gamesmanship". This behaviour would nowadays be penalised according to Section 2.5. of the Rules of Conduct of the ICC Code of Conduct. During a match against Zimbabwe during the 1983 Cricket World Cup, Richards returned to the crease after a stoppage for bad light and accidentally took strike at the wrong end, which remains a very rare occurrence. However, despite his totemic presence at the club, over time his performances declined as he devoted most of his time to international cricket. The county finished bottom of the County Championship in 1985, and next to bottom in 1986. New team captain Peter Roebuck became the centre of a major controversy when he was instrumental in the county's decision not to renew the contracts of Richards and compatriot Joel Garner for the 1987 season, whose runs and wickets had brought the county much success in the previous eight years. Somerset proposed to replace the pair with New Zealand batsman Martin Crowe. Consequently, Ian Botham refused a new contract with Somerset in protest at the way his friends Richards and Garner had been treated and he promptly joined local rivals Worcestershire. After many years of bitterness over the event and the eventual removal of Roebuck from the club, Richards was eventually honoured with the naming of a set of entrance gates and a stand after him at the County Ground, Taunton. After his sacking from Somerset, Richards spent the 1987 season in the Lancashire League playing as Rishton CC's professional, in preparation for the West Indies tour the following season. Richards returned to county cricket for the 1990 season towards the end of his career to play for Glamorgan, helping them to win the AXA Sunday League in 1993. 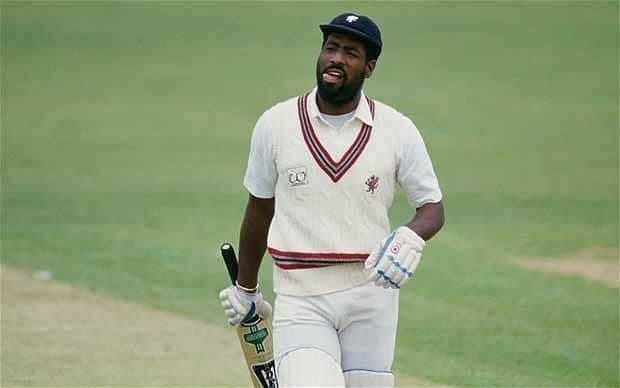 Richards refused a "blank-cheque" offer to play for a rebel West Indies squad in South Africa during the Apartheid era in 1983, and again in 1984. Richards is frequently heard on BBC's Test Match Special (TMS). Richards was featured in the 2010 documentary movie Fire in Babylon and spoke about his experiences playing for the West Indies. Richards joined the Delhi Daredevils as their Mentor in The Indian Premier League in 2013. Richards also mentored the Quetta Gladiators in the 2016 and 2017 Pakistan Super League. Quiet and self-contained away from the pitch, Richards was a very powerful right-handed batsman with an extremely attacking style, "possibly the most destructive batsman the sport has ever seen". He was also an excellent fielder and a more than competent off-spin bowler. He is often regarded as the most physically devastating and exciting batsman that ever played the game by cricketers, journalists, fans and others alike, and played his entire 17-year career without a helmet. His fearless and aggressive style of play, and relaxed but determined demeanor made him a great crowd favourite and an intimidating prospect for opposition bowlers all over the world. The word "swagger" is frequently used to describe his batting style. His batting often completely dominated opposing bowlers. He had the ability to drive good-length balls from outside off-stump through midwicket, his trademark shot, and was one of the great exponents of the hook shot. 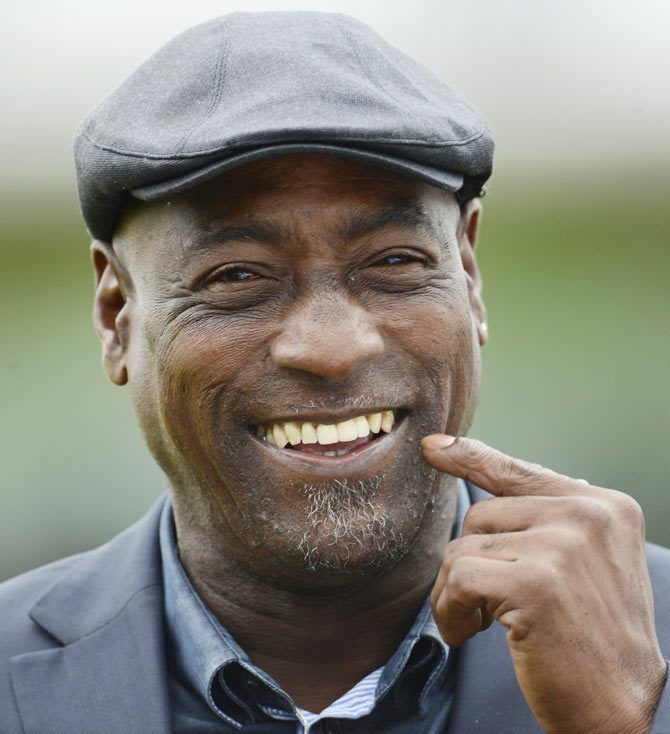 Viv Richards was notorious for punishing bowlers that dared to sledge him. So much so, that many opposing captains banned their players from the practice. However playing for Somerset in a county game against Glamorgan, Greg Thomas attempted to sledge Richards after he had played and missed at several balls in a row. He sarcastically informed Richards: "It's red, round and it's about five ounces, in case you were wondering." Richards then hammered the next delivery for 6, straight out of the stadium and into a nearby river. Turning back to the bowler, he commented: "You know what it looks like, now go and find it." In 1981, Richards published his autobiography entitled Hitting Across the Line. In the book, Richards describes how his whole life revolved around sports, cricket in particular. Of special interest is his technique, expressed by the title of the book. To hit across the line of the ball is considered taboo, and dangerously risky. However, Richards' explanation of the conditions in which he played cricket in Antigua as a child, explains how this technique came to be. Richards remains one of only four non-English cricketers to have scored 100 first-class centuries, the others being Australian Donald Bradman, New Zealander Glenn Turner and Pakistani Zaheer Abbas. He was chosen as a Wisden Cricketer of the Year for 1977. In 2000, Richards was named by a 100-member panel of experts one of the five Wisden Cricketers of the Century. He received 25 votes, behind Sir Donald Bradman (100 votes), Sir Garfield Sobers (90 votes), Sir Jack Hobbs (30 votes) and Shane Warne (27 votes). In 2000, Richards was named one of the five Wisden Cricketers of the Century, coming fifth behind Sir Donald Bradman, Sir Garfield Sobers, Sir Jack Hobbs and Shane Warne in the poll of 100 international cricket experts appointed by Wisden Cricketers' Almanack. Several prominent personalities including former cricketer Imran Khan and writer John Birmingham are of the opinion that Richards was the best ever batsman against genuine fast bowling. For Barry Richards, Ravi Shastri and Neil Fairbrother, he has been cited as the best batsman they personally witnessed. Wasim Akram rates Richards the greatest batsman he ever bowled to, ahead of Sunil Gavaskar and Martin Crowe. Crowe himself rates Richards as the best batsman he played against, along with Greg Chappell. Arguably the two greatest spinners ever, Muthiah Muralitharan and Shane Warne both idolize Richards. Murali idolized Richards in his years growing up, while Warne rates him the greatest batsman "for me", and overall just after Bradman. The ICC came out with their rankings for the best batsmen and bowlers in the history of the game for both the longer and shorter versions. The ratings for Test Cricket had Vivian Richards ranked 6th after Sir Donald Bradman, Sir Len Hutton, Sir Jack Hobbs, Ricky Ponting and Peter May. The ODI ratings placed Richards in 1st followed by Zaheer Abbas and Greg Chappell. These rankings were based on the level achieved by the batsmen at their respective peaks. He was voted the greatest cricketer since 1970 in a poll, ahead of Ian Botham and Shane Warne. That poll saw both Botham and Warne vote for Richards, and in the opinions of both, Richards is the greatest batsman they ever saw. In 2006, in a study done by a team of ESPN's Cricinfo magazine, Richards was again chosen the greatest ODI Batsman ever. Former cricketer Derek Pringle also rates Richards to be the best batsman ever in the history of Limited Overs Cricket. In his Test career, he scored 8,540 runs in 121 Test matches at an average of 50.23 (including 24 centuries). Richards also scored 5 centuries in World Series Cricket between 1977–79. These are not recognised by the ICC as "official" Test centuries. Richards won 27 of 50 matches as a Test captain, and lost only 8. He is also the scorer of the equal second fastest-ever Test century, from just 56 balls against England in Antigua during the 1986 tour. He hit 84 sixes in Test cricket. His highest innings of 291 is equal seventh (along with Ramnaresh Sarwan) on the list of West Indies' highest individual scores. In 1986, Richards became the first batsman to score a Test century at a strike rate of over 150. Richards scored the fastest century in Test history (56 balls) in 1986, being sole record holder until his feat was first equalled by Misbah-ul-Haq in 2014 and then eclipsed by Brendon McCullum's 54-ball ton in 2016. Richards set a record for being the fastest batsman to 1,000 ODI runs (21 innings); this record has subsequently been equaled by Kevin Pietersen, Babar Azam, Jonathan Trott and Quinton de Kock in just 21 innings. Richards was the first player to complete the double of scoring 1000 runs and taking 50 wickets in ODI history. In 1994, Richards was appointed an Officer of the Order of the British Empire (OBE) for services to cricket. In 1999, he was made a Knight of the Order of the National Hero (KNH) by his native country Antigua and Barbuda. The Sir Vivian Richards Stadium in North Sound, Antigua, is named in his honour. It was built for use in the 2007 Cricket World Cup. The ground has hosted three Test matches, as well as a number of One-Day Internationals and T20 Internationals. Some writers contend that Richards also played international football for Antigua and Barbuda, appearing in qualifying matches for the 1974 World Cup. However, he does not appear in recorded line-ups for these matches. Richards and his wife Miriam have two children: Matara, who currently lives in Toronto, Canada, and Mali, who has also played first-class cricket. Richards is also godfather to Ian Botham's son, Liam. 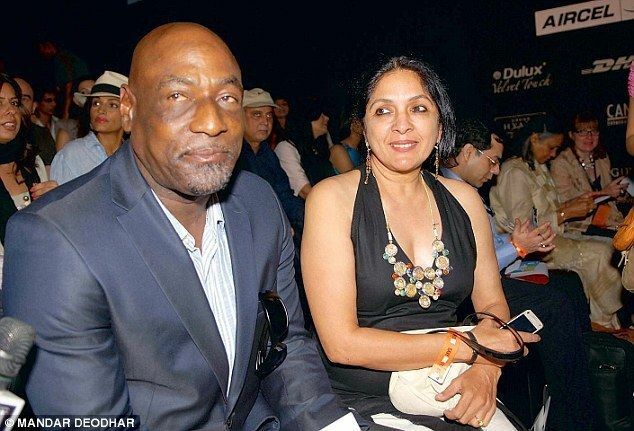 Richards had a brief relationship with Indian actress Neena Gupta, with whom he has a daughter, fashion designer Masaba Gupta, born in 1989. He is a supporter of Liverpool F.C. in English football's Premier League.